If you want the benefits of a custom-welded Eagle trailer, but on a budget, then Patriot is for you. These trailers grab popular features from Eagle, Yacht Club and everything in between to deliver a reliable and stylish trailer with silver wheels, bias ply tires, lights, drum brakes and standard black powder paint. Want to jazz it up even more? Explore color paint, aluminum wheels, radial tires and other optional features. 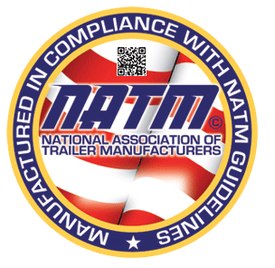 Click here to see a comparison of the standards and options available for each trailer series. Our series of painted steel trailers for fresh water applications. Available in single, tandem and tri-axle models, Eagle Series trailers have been built for craft measuring 15 to 50+ feet in length, with weights up to 15 tons. Glide-on/glide-off design makes loading and launching easier than ever before. With clear-coated chrome wheels, steel fender/step assemblies, aluminum diamond plate fender steps, a custom graphics package and color-matched marine grade carpet on the bunks and pads, this trailer makes an impressive aesthetic statement. Options available include a spare tire mount, aluminum mag wheels, sleek fiberglass fenders and many more. Unlimited Color Choice (Standard Paints) - Standard or N/C Opt. The full “bling” treatment: 18” custom wheels, performance directional tires, 5” frame, large aluminum diamond fender, top plates and backup lights. Designed for freshwater or saltwater use, these trailers combine maximum corrosion resistance with the rugged construction and high-profile aesthetics. Frames are welded and then galvanized with a hot-dip galvanized finish inside and out for a thick coating that is extremely resistant to saltwater. Competitors’ galvanized frames are usually mechanically fastened together, and may feature an electroplated coating, which is far less durable than the Eagle's hot-dipped galvanized finish. On our most popular Marlin Series models, we offer independent suspension rubber torsion axles, which are engineered with hot-dipped galvanized tubing and feature state-of-the-art bearing protection. Specially designed to custom-fit your inboard ski boat and protect the propeller and prop shaft, including vertical side guides, a prop guard system, and an extended rear step. Eagle Trailers are manufactured by HLT Limited. © Copyright Eagle Trailers. All rights reserved.